on May 10, 2016, 2:12 p.m.
Three times we have asked and three times we have been told: Bill Gates is the most admired man in the world. Since 2015, when we first begun to test the most admired men and women separately, Angelina Jolie has also come out on top both times. So in the third installation of YouGov's massive international study of personality admiration involving over 31,000 interviews, it's safe to say the global public values humanitarianism over politics. This year the story is in the movement further down the ranks. Thanks in part to a rise from 9th place to 4th (excluding local celebrities) in China, which makes up almost a third of the population of the 30 countries we've polled, Russian President Vladimir Putin is the biggest riser since 2015, moving from 11th to fifth overall. Stephen Hawking, boosted by box office hit biopic The Theory of Everything, rises to 5th place from 9th worldwide and is the most admired man overall in Britain – even including local celebrities such as David Attenborough. Taking local figures out of the picture Putin also ranks highly in Egypt, Saudi Arabia and Morocco. The biggest fallers on the male side compared to last year are Indian Prime Minister Narendra Modi, who was likely riding high in 2015 during his first year in the post, and Pope Francis – the biggest mover of all, who drops from sixth to 13th. After the promise of Catholic reform which set the Pope apart from his predecessors, the findings may demonstrate a dimming of excitement as the Argentinian becomes institutionalised. Xi Jingping ranks highly because of huge support in populous China, however Barack Obama has the most widespread admiration. In the list of global-only figures the US President ranks first in six countries and second in eight (Jinping is in the top ten in only two of 30 countries). 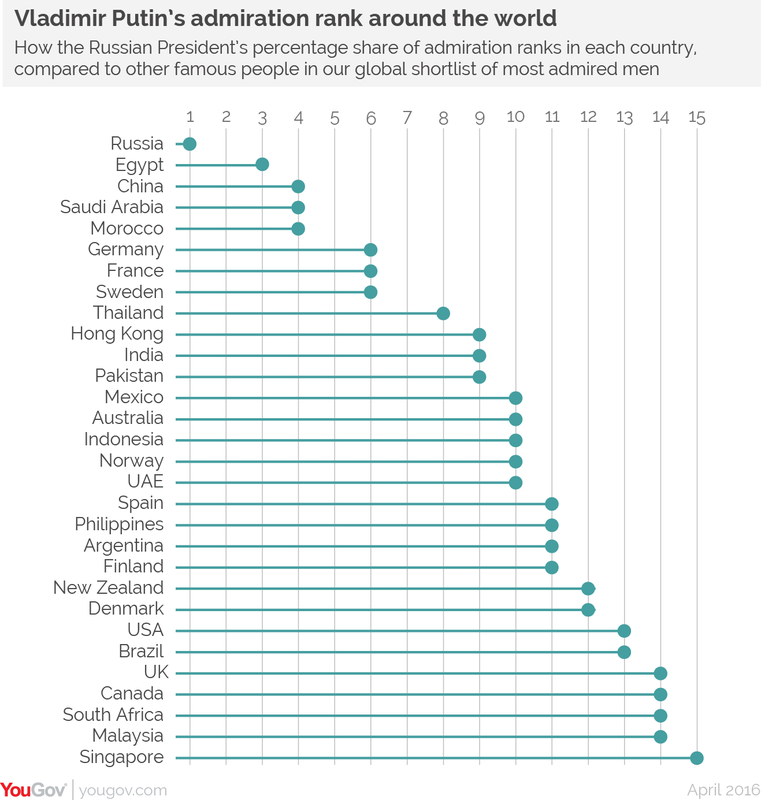 Only in one country, Russia, is Obama not in the top ten. 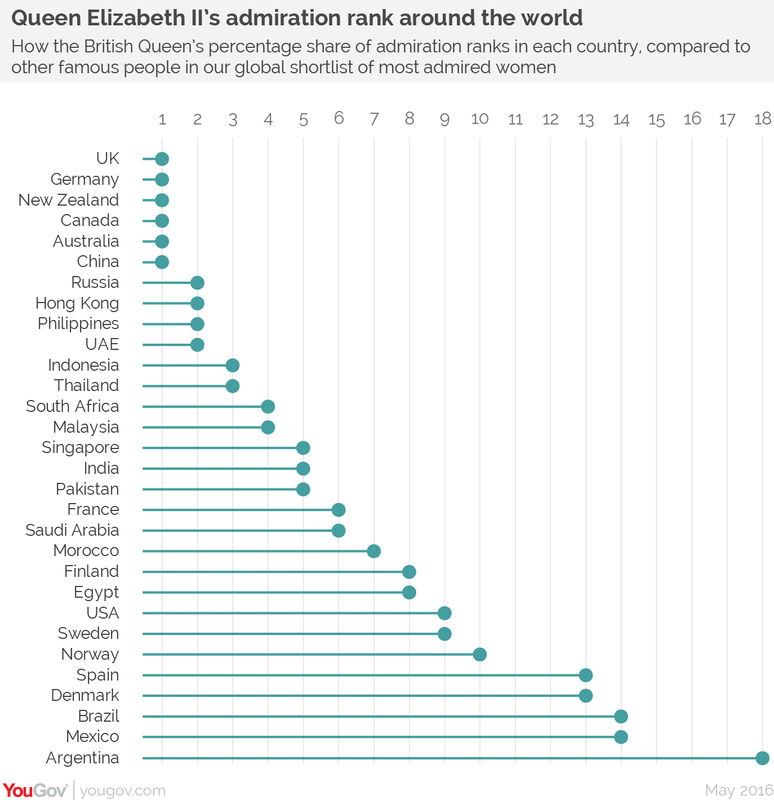 Queen Elizabeth fares similarly, ranking 2nd overall but placing in the top five in 17 countries. She also benefits from the admiration of China, aided by President Xi Jinping’s State visit to Britain, which the Queen called a “defining moment” in the future of China-UK relations. 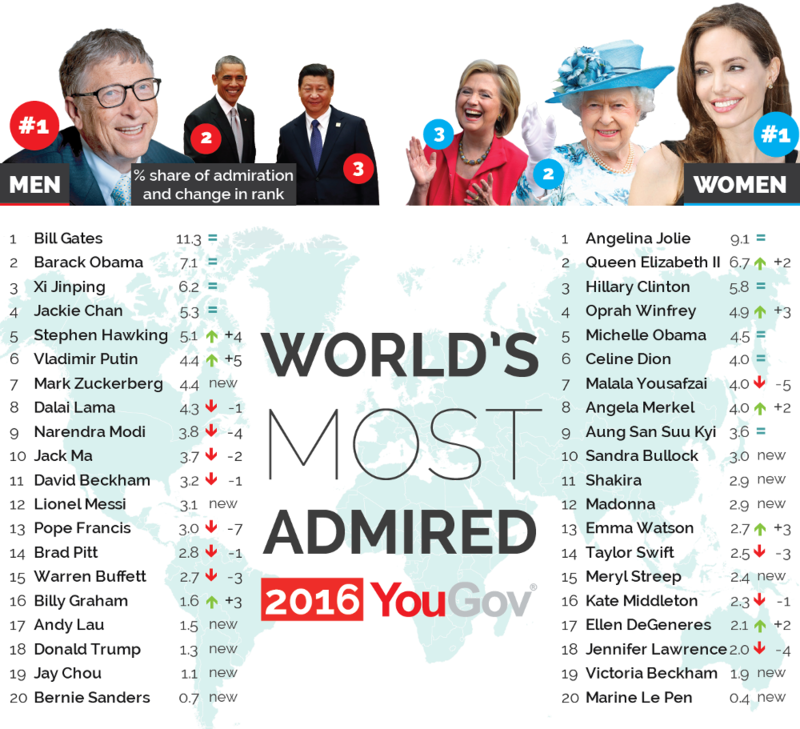 Hillary Clinton remains the third most admired woman, boosting her presidential bid with a show of global admiration nearly equal to Obama's. In the vast expanses of India and China she places first (ahead of Malala Yousafzai) and second (ahead of Angelina Jolie), respectively. Malala Yousafzai is the biggest faller on the women's side, however this indicates less a fall out of admiration than a fall out of the news. In Sweden, the country which bestowed on her the Nobel Peace prize in 2014, she ranks first and in Britain, Norway, India and Pakistan she ranks second. 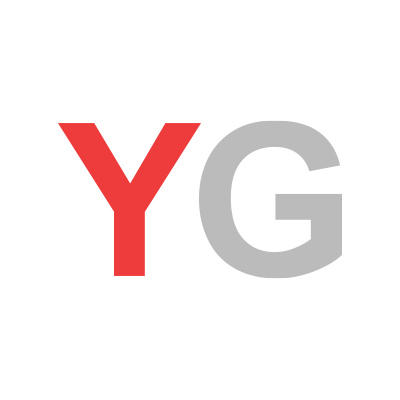 In December YouGov gathered open-ended nominations from panellists across 30 countries, asking them simply: “Thinking about people alive in the world today, which [man or woman] do you most admire?” These nominations were then used to compile a list of the 20 men and 20 women who received the most nominations and were nominated in at least four countries. An additional 10 popular local figures were added to the lists for individual countries. By asking respondents two questions, we can understand both the breadth (i.e. global reach) and the intensity of a person's support. Altogether, we polled in countries that constitute nearly two-thirds of the world's population. However, some parts of the world were better represented than others, so we weighted up the impact certain countries had on the final scores and weighted down others so the global scores more accurately reflect the breakdown of sentiment in the world overall. All of the surveys were conducted online, and in many of the countries the internet penetration is low to the point where the sample can only be said to be representative to the online population. The countries where the online population is lower than 60% of the total are Morocco, China, Mexico, Egypt, South Africa, Philippines, India, Thailand, Indonesia and Pakistan.